Kupala, whose name means “to bathe” is a Slavic mid-summer Goddess. She is known as a Goddess of Springs and Water. Her worshippers bathed in local rivers and collected dew each morning in June. The waters had been blessed by Kupala and had healing and purification powers, which also makes Her a Goddess of Healing. She is also a Goddess of Fire, with it’s purifying and protective qualities. At Her annual mid-summer festival, young men and women would jump over a purifying bonfire, dragging a straw maiden along with them. This image was garlanded with flowers and dressed in a beautiful gown. 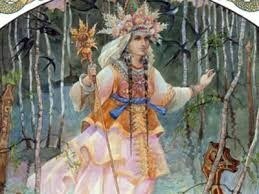 The straw maiden was then hung in a birch tree, which had been cut ritually, having all of its’ upper branches trimmed. This ritual was only done by women. Men could not touch either the figure, or the tree. The straw maiden was then released to the water and drifted away. As she floated away, Kupala removed all evil energies from the village. Kupala, as a Goddess of water personifies the magic inherent in water, and she is also known by the name of Water Mother. Offerings of flowers and plants, especially purple loosestrife and fern, which were sacred to Her, were often left as offerings at the river. Ferns are also called “the fire flame of Kupala”, and the roots of purple loosestrife banished both bad dreams and demons, but needed to be gathered at dawn on mid-summer. 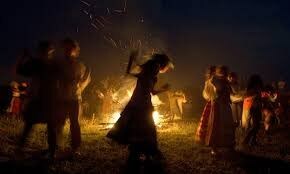 As the summer unfolds, may you be blessed many times by Kupala and Her healing and purifying waters.